Excuse us for living, but it’s about time we get back to more important things with another PastaPost recipe. By all statistical indicators of viewers, that these PastaPosts are more popular than any news and commentary is no surprise! And I am beginning to realize that each recipe comes with a story re how it came about. 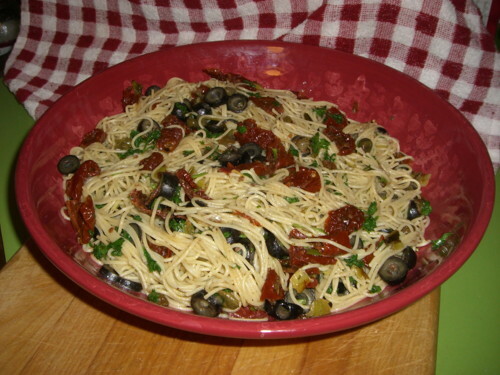 “Spaghetti & All That Jazz” started out as a simple, innocent Sicilian dish. – – Kind of a “peasant food” every ethnic group has. We grew up calling it, “Spaghetti & Butter,” because that’s all it was! – – A little spaghetti (Well, not so little. Maybe a pound for 2 people! ), a little reserved pasta water, butter melted into the pot of pasta, and your favorite grated cheese to taste. After many years of marriage, Geri and I got up enough nerve to resurrect this dish from my childhood. We rediscovered how good it really was as embarrassingly plain and simple it be! And it had the added virtue (and our real motivation) of being “sans garlic” for those famous “Friday Night” dinners (See the post by that title in the archives here!) followed by a social event on Saturday or Sunday. So, we kept “Spaghetti & Butter” in mind and made it “once in a blue moon” over the years. But then came one of those magical Friday Nights this past year 2012 like days of old when we “invented” a new recipe spontaneously. We were “going out” on a Saturday and decided to have Spaghetti & Butter. As the day approached late afternoon, I upped and said to Geri, “I feel like a little something more. That’s too boring, plain.” “What do you have in mind?” said Geri. “It needs some jazz, something to make it more interesting,” I said. “Like what?” she egged me on. “Maybe some black olives and capers. And sundried tomatoes…I always love those.” And that’s all I ever have to say to Geri. She is the master chef, takes the ball and runs with it, knows just what to do. To the above, she added scallions, red pepper, parsley, and followed through with the butter, grated cheese, and no garlic. And voila! Ambrosia! It was born! Now what to call it? Jazz? Geri had gone beyond that with all that jazz. What came naturally to our minds was the song, “And All That Jazz,” from one of our very favorite movies, “Chicago,” which brought to the screen that great Bob Fosse Broadway production (still going strong as the number one longest running AMERICAN musical in Broadway history!). What else to call it but, “Spaghetti & All That Jazz.” And it’s so good. How good? Adding garlic spoils it! We know! Melt 1/2 stick of butter in medium sauce pan. Add scallions & red pepper flakes & saute` until tender, 3-5 minutes. Add oil from sundried tomatoes & sundried tomatoes & heat gently. Remove from heat. Cook pasta in boiling salted water until al dente. Drain in colander. Toss with sauce, & add the black olives, capers, parsley, & the other 1/2 stick butter. Use grated cheese at the table to individual taste! Excuse us for living, but add this to the pasta recipes we love! Comments: Please, before or after you make it! I need to remember this one—thanks! I”m going to try it…but I’ll have to leave the olives out…Sue doesn’t like them. Can you imagine that! that recipe looks so simple, yet yummy…. Margaret, Thanks as always. Rialto’s good! You are right…this recipe is totally from us. Sometimes we find a recipe & alter it. Some recipes we follow, naturally. Sometimes we eat in a restaurant & try to reproduce it. On this one after you try it, you can use the pasta, butter, & grated cheese as the base & then make up your own by adding anything you like as your own “jazz.” Depending on what you add, you might want to leave out the cheese depending on your taste. Hope you had a good trip! Phil & Geri too! Gosh! It’s been so long since! I’ve had spaghetti with butter and cheese!! And absolutely no garlic! I think I’ll go “old school” with maybe some fresh basil. Then I’ll “jazz it up” the next time. Thanks for the resurrection! Joy, That’s how we were…rediscovering spaghetti & butter & how really good it is for such an embarrassingly simple dish!!! And you have a great idea…besides our recipe…..use the base of past & butter & make up your own/add your own “jazz”!!! It’s a novel approach to new recipes! We are going to have to try this approach too! We just realized it responding to people here! Maybe the grated cheese might be dropped depending on what you/we add. Fun! Thanks for the comment! Phil & Geri right here too! I didn’t know there are large capers—and I love the caper flavor in food –esp. with lemon and white wine.